Apple, the most valuable company in the world and the first business firm that could touch the 1 trillion worth in the coming time. The success of Steve Jobs’s legacy majorly depends on the iPhone and its craze across the globe. The tech giant holds the prominent position in the mobile industry that pushes it to come up with smarter iterations every year. Last year, Apple astonished everyone with iPhone X and started a new trend in smartphone design. During the first three months of the launch, the iPhone X was the best selling smartphone for the company. However, afterward, the iPhone 7 Plus and iPhone 8 took over the sales, and the one with bigger screen phone started to lose its charisma. Still, iPhone X initiated a new wave of full-screen design among the smartphone makers. Huawei and the Essential Phone were among the first one to adopt the notch for ditching the large bezel and achieving higher screen to body ratio. Now, we are all set to experience this year’s buzz that will be coming out in September. Apple is gearing up for September 2018 to introduce new iPhones. However, there is not a single word from the company about this year’s release so far, we know how much Apple likes to keep its upcoming smartphones a secret. However, some rumors and leaks came on the surface recently. We have collected some of the authentic information that is roaming around the smartphone industry regarding this year’s launch. The new iPhones are expected to come with enhanced performance, optimized speed, and high-resolution display. Well, frankly speaking this is every year’s story, and we are not here to mull over the same, instead we will be discussing new upgrade and rumored surprises. In spite of launching a new iPhone design like last year, Apple could come up with more versions of iPhone X. Though we are almost four months away from the Apple’s iPhone launching event, the latest rumors are making there way to the Apple fans. iPhone 9 or iPhone X2 or iPhone X Plus or iPhone 11, what it will be called? Now, the very first question that comes up in everyone’s mind is what will be the name of upcoming phone. There are some rumors regarding the name of the new iPhones, some of the industry experts believe Apple to restore its S series. On the other hand, after iPhone 8 and iPhone X, most of the Apple enthusiasts expect the new iPhone to be called iPhone X2 or iPhone 11. We aren't sure about the name of the 2018 iPhone yet, but we do know that Apple is unpredictable. There is another thing that we are sure about is that there won't be any iPhone 9 as it is doubtful for the company to turn back after launching iPhone X. However, if you ask me personally I will bet my money on iPhone X Plus as it suits more than anything else. Moreover, there are rumors about three iPhone variants coming this year. What surprises can we expect? If we look at the 2018 smartphone launch till date, almost every big company has moved to a bigger screen and alluring design with their flagship smartphones. We are expecting the similar approach from Apple to come up with its upcoming iPhone. With last year release that misses the iconic home button and owns a larger screen, Apple revolutionized the industry The companies like OnePlus 6, Oppo, and Vivo have taken this approach to a whole new level. We expect the other iPhones to adopt the iPhone X design for the full front screen without any home button. The new Apple phones would come with smaller bezels and thin dimension for compelling the users. However, rumors also suggest that Apple will keep its standard iPhone design intact with the affordable iPhone variant this year, but it will undoubtedly have some minor tweaks as well. 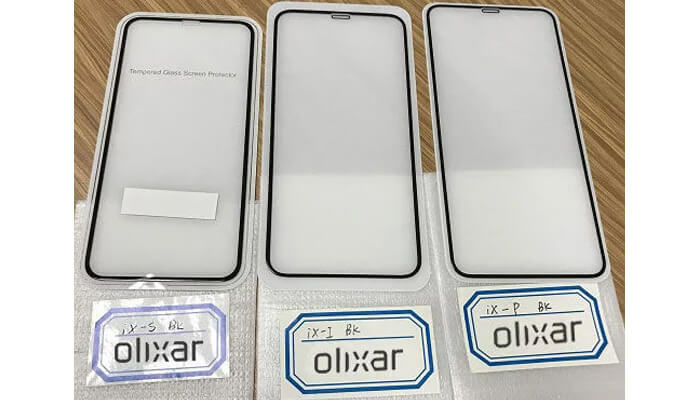 Olixar, the case maker for Apple phones has shared three new cases that are expected to belong to upcoming phones. 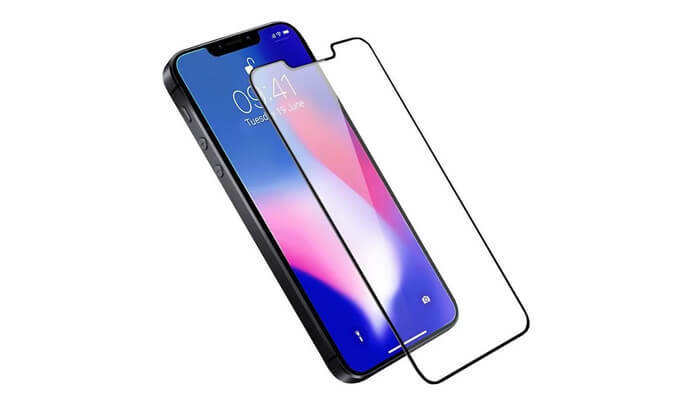 Moreover, MobileFun has published the dimensions of these screen protectors. And considering the MobileFun history regarding Apple phone predictions, these seem to be accurate. The notch in the display of the upcoming iPhones could be smaller than the iPhone X. Moreover, the Olixar case dimension from MobileFun also supports this rumor. This will help Apple to achieve larger screen to body ratio for its upcoming iPhone. Olixar has also shared its separate case for iPhone SE, which was spotted by 9to5 Mac. There will be a smaller notch on the iPhone SE, which could be the affordable version of iPhone X. Moreover, there are other rumors, which suggest that Apple could be working on the screen technology that enables to put sensors in between the pixels. According to Digital Trends, the sensors will be embedded in between the small gaps of pixels inside the display that is not visible to us. This will allow the company to make the notch smaller as it no longer has to carry the sensors. However, the technology looks pretty impossible to be launched in 2018 as there is no significant information available regarding this. On the other hand, some industry experts believe that Apple could combine the face recognition sensors and front camera into a single unit to further shorten the notch. LCD or LED or OLED or Micro LED? We have already told you that we are expecting three phones to knock at the market this year. 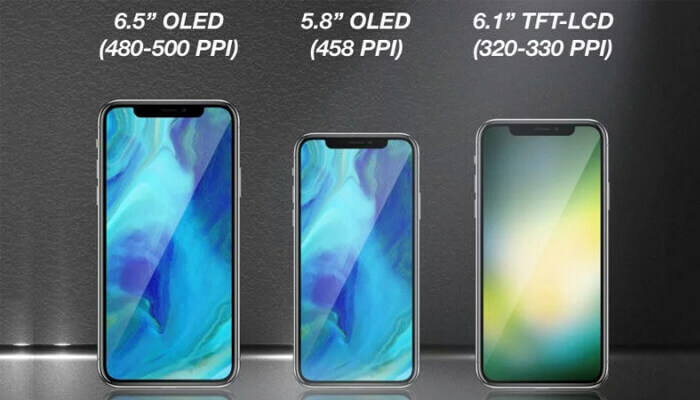 According to the recent rumors and claim by Ming-Chi Kuo there will be three models including the biggest display iPhone ever. In his report, Kuo mentioned that the new models will be coming in 6.5in, 6.1in and 5.8in sizes. Among all, the 6.5 inch iPhone matches the screen protector from Olixar. Some of the sources have revealed that 6.5in screen iPhone could come with an OLED display for which Apple made a deal with Samsung according to The Investor. However, we believe that Apple will use the Micro LED on which it has been secretly working in one of its production houses lately. The other lower price iPhone will stick to the traditional LCD screen form the company. On the contrary, there are a number of leaked images from different sources that reveal the phone’s components. Recently a Russian website Wylsa claimed to got it hands on iPhone schematics showing the basic design of new iPhone. However, we can't back up the accuracy of this leak from the website. 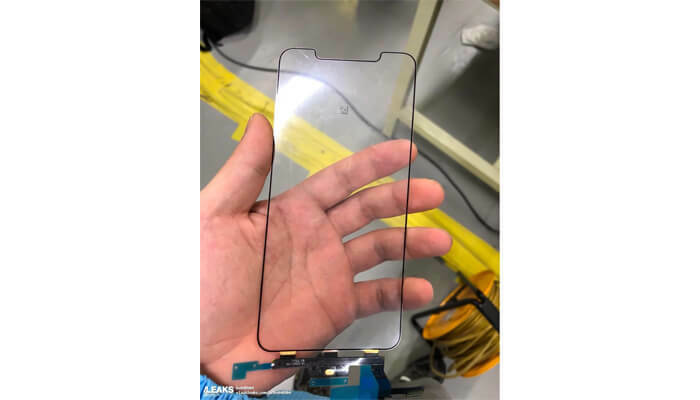 Moreover, there is an image showing the screen component of 6.1 inch iPhone shared by a Twitter user. The company revealed 6.1 inch OLED screen which goes against the rumors of 6.1 inch iPhone to be budget friendly with an LCD screen. Ming-Chi Kuo mentioned that Apple would be expanding its Face ID authentication to all the new Apple Phones in 2018. According to him, the facial authentication system will be coming to every new iPhone this year. However, the in-display fingerprint sensor is still a question. Moreover, the Kuo’s prediction is also backed up by Korean language site ET News and the Inventor who claimed that the Apple’s Asian supplier also confirmed the same. However, there are slight chances of Apple to embed in-display fingerprint sensor for the users. Back in 2013, the company has patented the below-mentioned design. 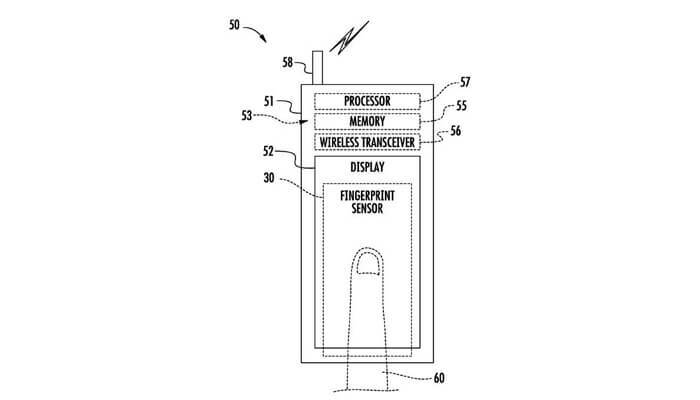 The design shows the inbuilt fingerprint authentication system that can be used as in-display Touch ID. 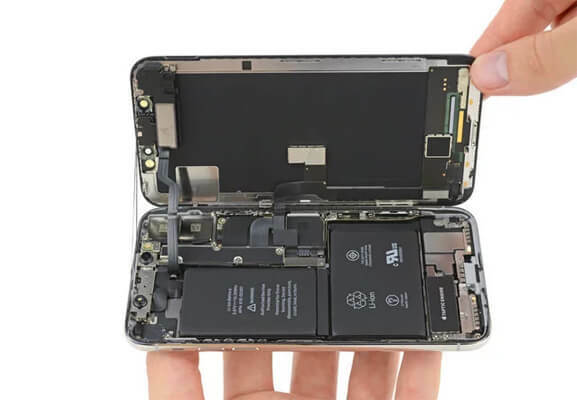 One thing that we are firmly sure about is the new chipset of the iPhone 2018. Apple will be replacing the processor with codenamed A12 chip. The new chip will be faster, smaller and more efficient than the 10 Fusion and A11 chip used by iPhone 7 and iPhone X respectively. According to the report from Bloomberg, Apple has already started the mass production of the chip under the guidance of TMSC. The design used to produce the chip is 7 nanometer in size instead of 10 nanometers. Apple is undoubtedly looking to improve the battery power of the iPhone which is a prime concern for the users. According to KGI analyst, Ming-Chi Kuo, the upcoming iPhone, having the LCD screen will be coming with 2850 or 2950 mAh. This will increase the battery capacity by 8% compared to iPhone X. 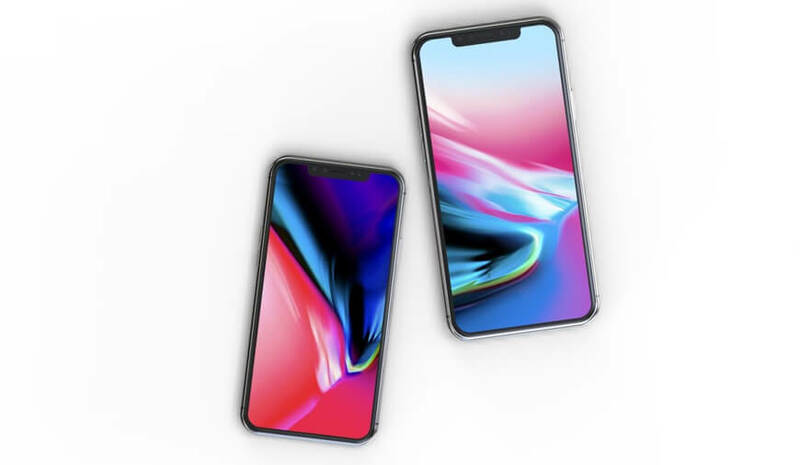 On the other hand, the iPhone with OLED display or simply iPhone X successor will come with a 3300 mAh L shaped battery. Kuo also claimed that the new iPhone X successor would be coming with a 4GB RAM, the iPhone X has 3GB RAM. Apple is known for starting a revolution in the tech world with a new approach. This year we are expecting the company to come up with a triple rear camera system. Our belief is supported by The Investor’s report which states that "one of Apple's next premium smartphones, reportedly named as the iPhone X Plus, is also anticipated to come fitted with three camera lenses on the rear." Moreover, the rumors have proven to be more authentic when Macrumors spotted a report from Chinese Economic Daily News website claiming the triple rear camera in iPhone X Plus. 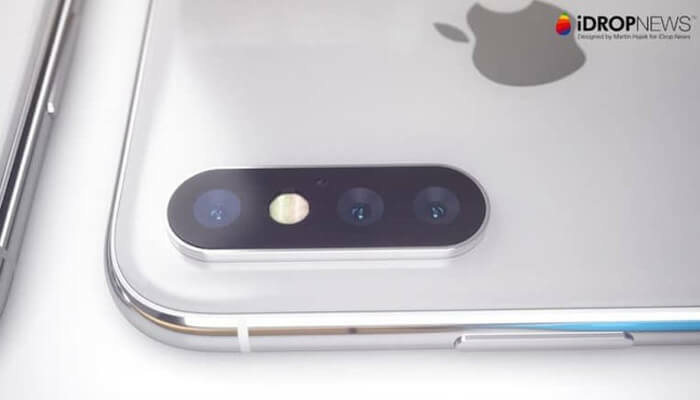 The things got more excited when Forbes posted a statement saying that the iPhone X Plus could get the vertically staggered three camera lenses. Apple sticks to its iPhone launching cycle that takes place every September. There is no reason to expect any change in the annual event schedule this year. So, it is very likely that we will be going to see the new Apple smartphones in September. PREVIOUS Is Your Browser A Victim of "Download Bomb" Bug?